Growing up only a few miles from the Atlantic Ocean, I have always felt a large connection with water. I spent my time growing up splashing in the waves, even skipping high school to ride my bike and bodyboard down to the beach to catch some waves. The ocean was always my place to go to de-stress, whether it was running the boardwalk in high school cross country practices, walking the boardwalk while talking with my mom, or running on the beach to feel alive. I’ve always lived where there was plenty of fresh water to drink and bathe in, too, but can you imagine not having enough desalinated water to drink? Or no access to a toilet? This is the reality for so many of us across the planet. 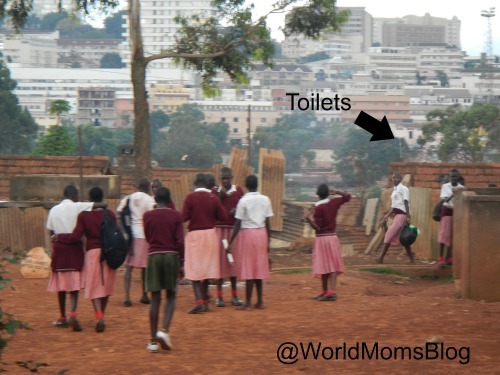 Did you know that 2.5 billion, or 1 in 3 people in the world do not have access to a toilet according to CNN? When I was in Uganda with the UN Foundation’s Shot@Life campaign in October 2012, I witnessed many people walking on the roads long distances with large yellow water jugs to collect clean water for their homes. 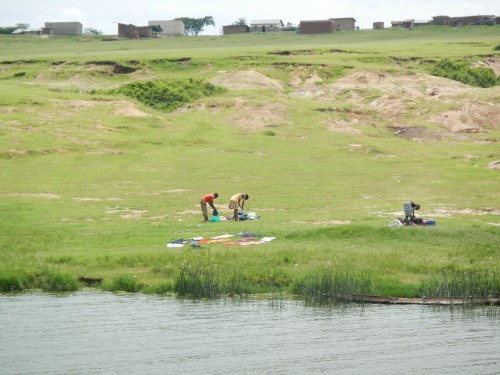 Here is an example of people near Queen Elizabeth National Park in Fort Portal, Uganda using the lake to wash their clothes. Mind you, it is a crocodile-ridden lake, so their safety was at risk. Another two-some carried water in the yellow jugs from the lake to their homes. Also, here is a water pump that was installed at a boarding school we visited in western Uganda. 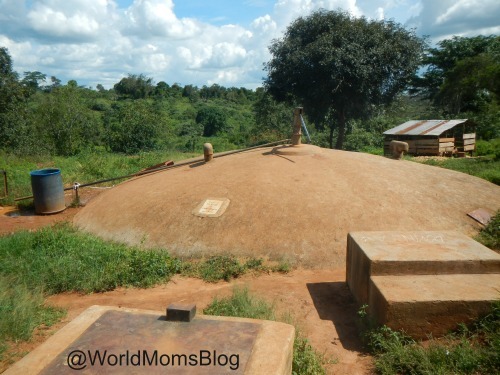 The school installed a rain collection system on the roofs of all of the buildings, which fed into this water pump because there is no running water there. 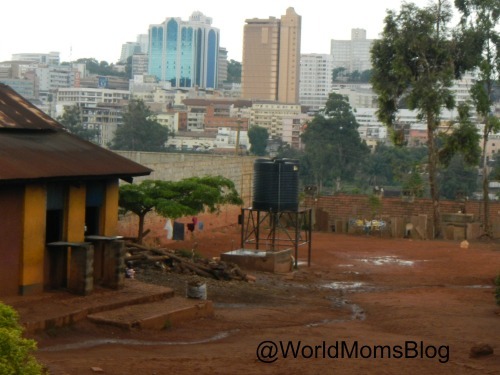 At Railway Children Primary School in Kampala, we found an example of a water tower. The cachement area for this school are the capital’s slums, and it is highly funded by UNICEF Uganda. This water tower makes it possible for the children to wash their hands after they use the toilets, which were then just newly installed. 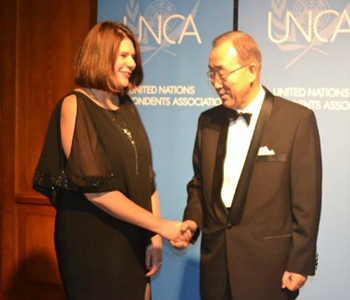 This is an original post to World Moms Blog by founder, Jennifer Burden, in New Jersey, USA. Photo credits to the author. Thank you,Jen, for always keeping important world issues and realities in the forefront of our minds. 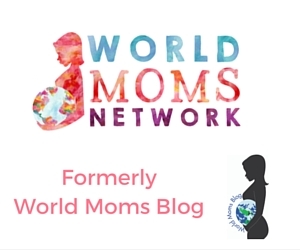 Especially those of us reading World Moms Blog, which means we are privilaged enough to have computer and Internet access, already putting us in positions of privilidge and plenty. Here’s to clean water and sanitary conditions for all. Thank you, Kyla. Yes, here’s to clean water for all! Such an important post to remind us, the privileged, of how much we take for granted. Thank you for keeping our eyes open! 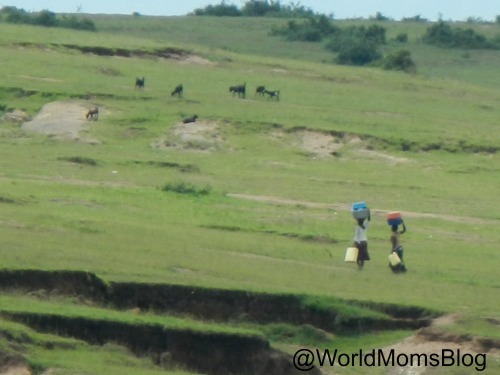 Women walking long distances to collect water for their households is also a fairly common sight in some rural areas in India. As a child in the apartment complex we lived, we had our fair share of water cuts. Being conscious of how we use water in our homes is ingrained in me. And so every time my 4 year old is brushing her teeth or taking a bath, I’m constantly telling her to be careful of how much water she uses and not waste it!